Be the first to share your favorite memory, photo or story of Betty Jane . This memorial page is dedicated for family, friends and future generations to celebrate the life of their loved one. 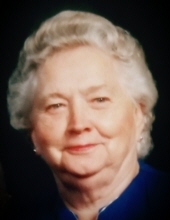 Mrs. Betty Jane Cartee Green, 87 of Hillview Community, passed away Sunday morning, January 27, 2019 at her residence surrounded by her loving family. She was born on October 10, 1931 to Mr. Charlie Jackson and Mrs. Mary Lanier Cartee in Pulaski, Ga. She was retired from the Tattnall County Board of Education, serving in the lunchroom of Reidsville Elementary School after 22 years of loyal service. She was a member of Evergreen Baptist Church for 70 years, was a member of the Adult Sunday School Class and was the oldest female member. In her spare time she enjoyed sewing, cooking, tending to her vegetable garden, and taking care of her family and told them that she loved them a bushel and peck and a hug around the neck. She was preceded in death by her husband of 42 years and father of children, Grover Green, her husband of six years, Sam Greene, her parents and nine brothers and sisters. Seven grandchildren, five great grandchildren, eight step grandchildren and one step great grandchild. Numerous nieces and nephews also survive. The family will receive friends on Tuesday evening; January 29, 2019 at Evergreen Baptist Church from 5:00 p.m. to 7:00 p.m. Funeral services will be conducted on Wednesday morning, January 30, 2019 at 11:00 a.m. from Evergreen Baptist Church with Rev. John Geerdes officiating. Mrs. Green will lie in state one hour prior to the service. Burial will follow in the church cemetery. Pallbearers will be: Grant Greene, Ross Greene, Cody Harris, Lance Lively, Brian Green, and Kory Akins. Honorary Pallbearers will be Deacons of Evergreen Baptist Church. Remembrances may be made to the Evergreen Baptist Church, AWANA program, P.O Box 325 Cobbtown, GA 30420 or to Ogeechee Area Hospice, P.O Box 531 Statesboro, GA 30457. Kennedy-Brannen Funeral Homes, Cobbtown Chapel is in charge of arrangements. To send flowers or a remembrance gift to the family of Betty Jane Cartee Green, please visit our Tribute Store. "Email Address" would like to share the life celebration of Betty Jane Cartee Green. Click on the "link" to go to share a favorite memory or leave a condolence message for the family.